In order to help broaden the reach of the PAYG business model, IFC has developed a Market Attractiveness Index that provides companies with granular data to inform market entry strategies for 14 countries in Africa. The Index is based on various high-quality datasets covering critical aspects of the commercial opportunity and enabling environment conditions for the 14 selected countries, thereby serving as an analytical tool to support PAYG companies in evaluating and prioritizing market entry opportunities. 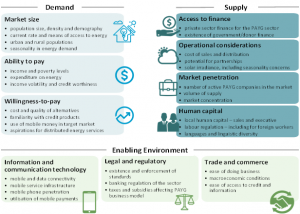 The PAYG Market Attractiveness Index has been structured around three main pillars, comprising a total of 70 individual indicators. This Index is intended to help PAYG companies, investors, development partners and other stakeholders to assess the opportunities to expand into other markets. The friendly user interface allows for adjustments to the weighting of the different variables, enabling the user to consider different aspects that may affect the underlying business model of the company and identifying specific areas that may present risks to be mitigated. The Index could also be utilized by policy makers and development partners to identify specific gaps or areas that require actions to create a more conducive business environment for PAYG companies to operate in a given country.